Home Lifestyle World’s Top Most Beautiful Places To Visit In Your Lifetime! World’s Top Most Beautiful Places To Visit In Your Lifetime! Everyone has the inner desire to travel across the world and visit the natures beautiful sites. However one often gets confused with so many places to visit and so many options cropping up. N4M Network comes up with a list of World’s Top 10 most beautiful places to visit before you die. These are incredibly picturesque places chosen with due diligence from across the the world. So plan out the ones that you would prefer to visit first and do let us know your views and comments below the article. If you are backpacking in Scotland generally or are planning a trip to the Isle of Skye then I heartily recommend that you visit the so-called Fairy Pools.The Fairy Pools is located in Cuillins Hills, Isle of Skye, Scotland. The Fairy Pools are a series of clear, cold pools and waterfalls formed as Allt Coir’ a’ Mhadaidh tumbles down from the foothills of the Black Cuillins into Glen Brittle. 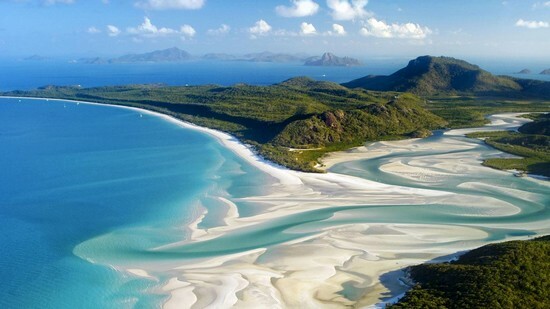 Whitehaven Beach is known for its white sands. The Beach is a 7 km stretch along Whitsunday Island. The island is accessible by boat from the mainland tourist ports of Airlie Beach and Shute Harbour, as well as Hamilton Island. The Beach was named the top Eco Friendly Beach in the world by CNN.com. Dogs are not permitted on the beach and cigarette smoking is prohibited. A fantastic lobby with waterfalls and pools greets visitors to this lush Kaanapali resort where the impressive scenery, friendly service, fabulous spa and awesome swimming pools are the highlights. The Westin Maui Resort & Spa, Ka’anapali is located along a breathtaking stretch of the gorgeous, white-sand Ka’anapali Beach. Azure temple, Lake General Carrera in Patagonia, Chile, A natural wonder that could be the world’s most beautiful cave network. An Azure Temple created by nature, the walls of this network of water-filled marble caverns show just how magnificent the precious geography of our planet can be. This bridge was constructed in 17th century to connect towns at the tops of mountains in the state of Yemen. Shahara Bridge built to fight against Turkish invaders. It’s a scary bridge and a popular tourist attraction. Havasu Falls is paradise on Earth. This is an absolutely amazingly beautiful waterfall located in a remote canyon of Arizona. The spectacular waterfalls and isolated community within the Havasupai Indian Reservation attract thousands of visitors each year. The Havasupai are intimately connected to the water and the land. This blue- green water is sacred to the Havasupai. Fjaðrárgljúfur is a canyon in south east Iceland which is up to 100 m deep and about 2 kilometres long, with the Fjaðrá river flowing through it. It is located near the Ring Road, not far from the village of Kirkjubæjarklaustur.The canyon was created by progressive erosion by flowing water from glaciers through the rocks and palagonite over millennia. The second largest lake in Kashmir, Dal Lake, is one of the leading attractions in Kashmir. The view of the lake is stunning with mountains on its three sides and lush greenery on its banks. Houseboats not only give you an excellent opportunity to travel the length and breadth of the lake but they also provide you unique experience that will remain fresh in your memory for long. This beautiful avenue of beech trees was planted by the Stuart family in the eighteenth century. The Dark Hedges is one of the most photographed natural phenomena in Northern Ireland and a popular attraction for tourists from across the world. It was intended as a compelling landscape feature to impress visitors. Mersa Matruh is a major Egyptian tourist resort and serves as a getaway resort for Europeans as well as Cairenes eager to flee the capital in the sweltering summer months. It is served by Mersa Matruh Airport. The city is known for its white soft sands and calm transparent waters. Inside Out Of PUBG : Should It Be Banned In India? Can Drinking Tea Prevent Diabetes? Study Says Yes.